For other uses, see Another Day in Paradise (disambiguation). 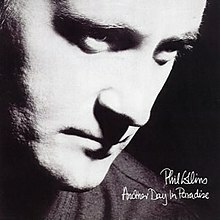 (1988) "Another Day in Paradise"
(1989) "I Wish It Would Rain Down"
"Another Day in Paradise" is a song recorded by English drummer and singer-songwriter Phil Collins. Produced by Collins along with Hugh Padgham, it was released as the first single from his number-one album ...But Seriously (1989). As with his song for Genesis, "Man on the Corner", the track has as its subject the problem of homelessness; as such, the song was a substantial departure from the dance-pop music of his previous album, No Jacket Required (1985). Collins sings the song from a third-person perspective, as he observes a man crossing the street to ignore a homeless woman, and he implores listeners not to turn a blind eye to homelessness because, by drawing a religious allusion, "it's just another day for you and me in paradise". Collins also appeals directly to God by singing: "Oh Lord, is there nothing more anybody can do? Oh Lord, there must be something you can say." The song was Collins' seventh and final Billboard Hot 100 No. 1 single, the last No. 1 single of the 1980s and the first No. 1 single of the 1990s. It was also a worldwide success, eventually becoming one of the most successful songs of his solo career. It won Collins and Padgham the Grammy Award for Record of the Year at the 1991 awards ceremony, while it was also nominated for Song of the Year, Best Pop Vocal Performance, Male and Best Music Video, Short Form. "Another Day in Paradise" also won an award for British Single at the 1990 Brit Awards. Despite the awards gained following its release, the song also generated some controversy over its subject matter and has received a largely negative reaction from music critics. Collins and David Crosby's live performance of the song at the 1991 Grammy Awards was released on the 1994 album Grammy's Greatest Moments Volume I. In 2009, Collins's version was listed at 86th on Billboard's Greatest Songs of All Time. "Another Day in Paradise" has since been covered by several artists, including Brandy, her brother Ray J, Jam Tronik, Axxis, Novecento, and Hank Marvin. The song was another massive hit for Collins. On 23 December 1989, it became his seventh (and to date, final[update]) No. 1 single in the U.S. The song was also the final No. 1 song of the 1980s in the U.S., and remained at No. 1 for four weeks, which classifies the song as a hit from the 1990s as well. This song is notable for keeping Janet Jackson's "Rhythm Nation" from reaching No. 1. It also saw out the 1980s and saw in the 1990s at the top of the German singles chart. The song had already reached No. 2 in the UK in November of that year. The single version is slightly different from the album version in that it uses a shorter intro. David Crosby also provided backing vocals. Music historian Colin Larkin wrote that "Another Day in Paradise" had been widely criticised. Collins addressed the criticism from the English rock press at the time of its release, who found him unqualified to sing about the poor due to his wealth, by saying: "When I drive down the street, I see the same things everyone else sees. It's a misconception that if you have a lot of money you're somehow out of touch with reality." Singer-songwriter and political activist Billy Bragg was scathing of the song in an interview in 2000, drawing a contrast between Collins and a band he admired, the Clash, stating: "Phil Collins might write a song about the homeless, but if he doesn't have the action to go with it he's just exploiting that for a subject." In 2003, Andrew Collins described the song as a "bland redress" for the subject of homelessness in the New Statesman. Caroline Sullivan of The Guardian dismissed the track in 2007 as "a song that addressed the issue of homelessness with the same insight as Sporty Spice's 'If That Were Me'". Writing for the BBC in 2010, David Sheppard described the song's lyrics as "cringe-worthy" and gave it as an example of Collins "painting the bull's-eye on his own forehead" when it came to his negative status with music critics. Writing for MSN in 2013, Hugh Wilson contrasted Collins's concern for the homeless in the song with his concern as a multimillionaire at the prospect of the UK's election of a tax-raising socialist government. Referring to Collins's statement that he would consider leaving the UK with the election of a Labour government, Wilson noted that the song led to "accusations of hypocrisy" because Collins had "bemoaned the plight of the homeless" in it. Wilson also said Collins became "an easy target when future elections came round". Less than six months after the release of the original Phil Collins version, a cover version by dance act Jam Tronik was released in the UK. In April 1990, it peaked at number 19 on the UK Singles Chart. Sampled in this version is the drum loop from the 1988 Raze song "Break 4 Love". 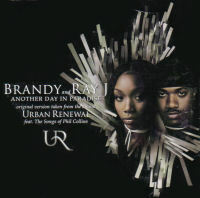 (2000) "Another Day in Paradise"
(1998) "Another Day In Paradise"
In 2001, siblings Brandy and Ray J covered the song for the Phil Collins tribute album Urban Renewal. Produced by Guy Roche and released as the album's lead single, the cover version became a top ten success in Austria, Germany, Sweden, Switzerland, Belgium, Norway, Ireland, the Netherlands, and the UK, receiving gold certifications in Australia (35,000), France (250,000), Germany (250,000) and Switzerland (20,000). In 2002, this version of the song was included on the European edition of Brandy's Full Moon album. In 1990, the song was covered by the London Symphony Orchestra on their album Soft Rock Symphonies, Vol. II. In 1990, Turkish singer Cengiz Coşkuner covered it as "Yok Olmaz" (also included instrumental version) in his Seni Gidi Seni & Kapris Yapma album. In 1992, Dennis Brown included a version of the song on his album "Another Day in Paradise". In 1992, Hank Marvin did an instrumental version of the song on his solo album Into the Light. In 2003, the song was covered by indie rock band Copeland on their EP "Know Nothing Stays the Same". In 2006, the song was heavily sampled by British electronic duo Supafly Inc. in their song, "Moving Too Fast". In 2007, the song was covered by ska punk band Reel Big Fish on their album "Monkeys for Nothin' and the Chimps for Free". In 2008, the song was covered by Big Daddy Weave, a CCM band, on their album What Life Would Be Like. In 2011, the song was covered by the charity ensemble Les Enfoires, translated to French and entitled d'Un jour de Plus au Paradis, at their concert Dans l'oeil des Enfoires. It was later released as a single. Argentinian singer Miguel Mateos recorded a version of the song that was included on "La 100 FM"'s album. Rapper Berner sampled this song for his early 2013 release "Paradise" featuring Wiz Khalifa. The Voice contestant Jonny Gray of Austin, Texas, covered the song with an indie tone on 11 November 2013 while also playing acoustic guitar. In 2013, Jamaican reggae musician Duane Stephenson produced a cover version of the song, entitled "Think Twice", in which the a few of the lyrics of the song were changed to local areas of Kingston, Jamaica. In 2016, the song was covered by Remady & Manu-L. Ronan Keating also performed a version of the song on the Chris Evans Radio 2 show. In 2016, the song was covered by Casa & Nova. Their cover was nominated by The Hollywood Music in Media Awards (HMMA) in the category EDM (Electronic Dance Music). ^ a b "BPI > Certified Awards > Search results for Phil Collins (page 3)". British Phonographic Industry. Retrieved 16 February 2016. ^ a b Maury Dean (2003). Rock N' Roll Gold Rush. Algora. p. 60. ISBN 0-87586-207-1. ^ "Grammy's Greatest Moments, Volume 1: Various Artists". Amazon.com. Retrieved 21 November 2011. ^ "Billboard's Greatest Songs of All Time". Billboard. Archived from the original on 25 April 2009. Retrieved 1 May 2009. ^ Larkin, Colin (14 September 2007). The Encyclopedia of Popular Music: Concise (5th Edition). Omnibus Press. ISBN 1846098564. Retrieved 21 August 2014. ^ Holden, Stephen (6 December 1989). "The Pop Life". The New York Times. The New York Times Company. Retrieved 21 August 2014. ^ Collins, Andrew (24 February 2003). "Give music a chance". New Statesman. Retrieved 9 February 2014. ^ Sullivan, Caroline (19 September 2007). "I wish I'd never heard of Phil Collins ..." The Guardian. Retrieved 9 February 2014. ^ Sheppard, David. "Phil Collins Going Back Review". BBC. Retrieved 16 April 2014. ^ Wilson, Hugh (3 April 2013). "Famous men and their misunderstood politics". MSN. Archived from the original on 22 February 2014. Retrieved 16 April 2014. ^ "Australian-charts.com – Phil Collins – Another Day in Paradise". ARIA Top 50 Singles. ^ "Austriancharts.at – Phil Collins – Another Day in Paradise" (in German). Ö3 Austria Top 40. ^ "Ultratop.be – Phil Collins – Another Day in Paradise" (in Dutch). Ultratop 50. ^ "Top RPM Singles: Issue 6660." RPM. Library and Archives Canada. Retrieved 9 April 2019. ^ "Top RPM Adult Contemporary: Issue 6628." RPM. Library and Archives Canada. Retrieved 9 April 2019. ^ "Top 10 Denmark" (PDF). Music & Media. Retrieved 22 March 2018. ^ "Lescharts.com – Phil Collins – Another Day in Paradise" (in French). Les classement single. ^ "Offiziellecharts.de – Phil Collins – Another Day in Paradise". GfK Entertainment Charts. Retrieved 9 April 2019. ^ "The Irish Charts – Search Results – Another Day in Paradise". Irish Singles Chart. Retrieved 9 April 2019. ^ a b "I singoli più venduti del 1990". Hit Parade Italia. Retrieved 15 September 2013. ^ "Nederlandse Top 40 – week 48, 1989" (in Dutch). Dutch Top 40 Retrieved 9 April 2019. ^ "Dutchcharts.nl – Phil Collins – Another Day in Paradise" (in Dutch). Single Top 100. Retrieved 9 April 2019. ^ "Charts.nz – Phil Collins – Another Day in Paradise". Top 40 Singles. ^ "Norwegiancharts.com – Phil Collins – Another Day in Paradise". VG-lista. ^ "Notowanie nr408" (in Polish). LP3. 16 December 1989. Retrieved 9 April 2019. ^ "Swedishcharts.com – Phil Collins – Another Day in Paradise". Singles Top 100. ^ "Swisscharts.com – Phil Collins – Another Day in Paradise". Swiss Singles Chart. ^ "Official Singles Chart Top 100". Official Charts Company. Retrieved 9 April 2019. ^ "Phil Collins Chart History (Hot 100)". Billboard. Retrieved 9 April 2019. ^ "Phil Collins Chart History (Adult Contemporary)". Billboard. Retrieved 9 April 2019. ^ "Phil Collins Chart History (Mainstream Rock)". Billboard. Retrieved 9 April 2019. ^ "Jaaroverzichten 1989" (in Dutch). Ultratop. Retrieved 9 April 2019. ^ "Top 100 Hit Tracks of 1989". RPM. Library and Archives Canada. Retrieved 22 March 2019. ^ "Jaaroverzichten - Single 1989" (in Dutch). MegaCharts. Retrieved 9 April 2019. ^ "Year-End Charts '89 – Top 100 Singles". Music Week. London, England: Spotlight Publications. 3 March 1990. p. 16. ^ "Jahreshitparade Singles 1990" (in German). Retrieved 9 April 2019. ^ "Jaaroverzichten 1990" (in Dutch). Ultratop. Retrieved 9 April 2019. ^ "Top 100 Hit Tracks of 1990". RPM. Library and Archives Canada. Retrieved 22 March 2019. ^ "Top 100 Adult Contemporary Tracks of 1990". RPM. Library and Archives Canada. Retrieved 9 April 2019. ^ "Top 100 Singles - Jahrescharts 1990" (in German). GfK Entertainment. Retrieved 9 April 2019. ^ "Schweizer Jahreshitparade 1990" (in German). Schweizer Hitparade. Hung Medien. Retrieved 15 September 2013. ^ "Billboard Top 100 - 1990". Archived from the original on 17 January 2010. Retrieved 15 September 2009. ^ "InfoDisc : Les Certifications (Albums) du SNEP (Bilan par Artiste)". Institut français d'opinion publique (in French). InfoDisc.fr. Search for "Phil Collins" and press "OK" to see the search results. Archived from the original on 30 November 2007. Retrieved 6 November 2015. ^ "Gold-/Platin-Datenbank (Phil Collins; 'Another Day In Paradise')" (in German). Bundesverband Musikindustrie. Retrieved 6 November 2015. ^ "Swedish single certifications – Phil Collins – Another Day in Paradise" (in Swedish). Swedish Recording Industry Association. Archived from the original on 6 November 2015. Retrieved 6 November 2015. ^ "American single certifications – Phil Collins – Another Day In Paradise". Recording Industry Association of America. Retrieved 6 November 2015. If necessary, click Advanced, then click Format, then select Single, then click SEARCH. ^ "Ultratop.be – Jam Tronik – Another Day in Paradise" (in Dutch). Ultratop 50. Retrieved 27 May 2013. 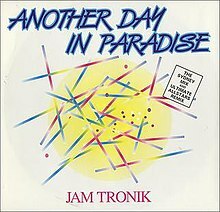 ^ "Offiziellecharts.de – Jam Tronik – Another Day in Paradise". GfK Entertainment Charts. Retrieved 9 April 2019. ^ "Australian-charts.com – Brandy And Ray J – Another Day In Paradise". ARIA Top 50 Singles. Retrieved 2011-05-23. ^ "Austriancharts.at – Brandy And Ray J – Another Day In Paradise" (in German). Ö3 Austria Top 40. Retrieved 2011-05-23. ^ "Ultratop.be – Brandy And Ray J – Another Day In Paradise" (in Dutch). Ultratop 50. Retrieved 2011-05-23. ^ "Ultratop.be – Brandy And Ray J – Another Day In Paradise" (in French). Ultratop 50. Retrieved 2011-05-23. ^ "Danishcharts.com – Brandy And Ray J – Another Day In Paradise". Tracklisten. Retrieved 2011-05-23. ^ "Euro Chart Hot 100" (PDF). Music & Media. 23 June 2001. p. 12. Retrieved 7 January 2018. ^ "Lescharts.com – Brandy And Ray J – Another Day In Paradise" (in French). Les classement single. Retrieved 2011-05-23. ^ "Offiziellecharts.de – Brandy and Ray J – Another Day In Paradise". GfK Entertainment Charts. Retrieved 10 October 2018. ^ "Chart Track: Week 25, 2001". Irish Singles Chart. Retrieved 2011-05-23. ^ "Nederlandse Top 40 – week 22, 2001" (in Dutch). Dutch Top 40 Retrieved 8 December 2017. ^ "Dutchcharts.nl – Brandy And Ray J – Another Day In Paradise" (in Dutch). Single Top 100. Retrieved 2011-05-23. ^ "Charts.nz – Brandy And Ray J – Another Day In Paradise". Top 40 Singles. Retrieved 2011-05-23. ^ "Norwegiancharts.com – Brandy And Ray J – Another Day In Paradise". VG-lista. Retrieved 2011-05-23. ^ "Swedishcharts.com – Brandy And Ray J – Another Day In Paradise". Singles Top 100. Retrieved 2011-05-23. ^ "Swisscharts.com – Brandy And Ray J – Another Day In Paradise". Swiss Singles Chart. Retrieved 2011-05-23. ^ "Official R&B Singles Chart Top 40". Official Charts Company. Retrieved 26 November 2017. ^ "ARIA Charts – End of Year Charts – Top 100 Singles 2001". Australian Recording Industry Association. Retrieved 23 January 2018. ^ "Jahreshitparade Singles 2001" (in German). Retrieved 9 April 2019. ^ "Jaaroverzichten 2001" (in Dutch). Ultratop. Retrieved 23 January 2018. ^ "Rapports Annuels 2001" (in Dutch). Ultratop. Retrieved 23 January 2018. ^ "Classement Singles – année 2001" (in French). Syndicat National de l'Édition Phonographique. Archived from the original on 23 January 2018. Retrieved 23 August 2013. ^ "Top 100 Single-Jahrescharts 2001". offiziellecharts.de (in German). GfK Entertainment. Retrieved 23 January 2018. ^ "Dutchcharts.nl – Jaaroverzichten – Single 2001" (in Dutch). Hung Medien. Retrieved 23 January 2018. ^ "Årslista Singlar – År 2001". Sverigetopplistan. Archived from the original on 19 July 2011. Retrieved 23 January 2018. ^ "Hitparade.ch – Jahreshitparade 2001". Swiss Music Charts. Hung Medien (in German). Retrieved 23 January 2018. ^ "ChartsPlus Year-End 2001" (PDF). UKChartsPlus. Retrieved 23 January 2018. ^ "French single certifications – Brandy – Another Day in Paradise" (in French). Syndicat National de l'Édition Phonographique. ^ "Gold-/Platin-Datenbank (Brandy & Ray J; 'Another Day in Paradise')" (in German). Bundesverband Musikindustrie. ^ "The Official Swiss Charts and Music Community: Awards (Brandy & Ray J; 'Another Day in Paradise')". IFPI Switzerland. Hung Medien. ^ "British single certifications – Brandy & Ray-J – Another Day in Paradise". British Phonographic Industry. Retrieved 15 June 2018. Select singles in the Format field. Select Silver in the Certification field. Type Another Day in Paradise in the "Search BPI Awards" field and then press Enter. ^ "Soft Rock Symphonies (1990): London Symphony Orchestra". Amazon.co.uk. Retrieved 19 November 2011. ^ "Last.fm/music". Last.fm. 21 November 2008. Retrieved 1 May 2009. ^ "The Voice". Wetpaint.com. Retrieved 23 March 2017. ^ "Remady & Manu-L – Another Day In Paradise". YouTube. 15 January 2016. Retrieved 23 March 2017. ^ "Ronan Keating - Another Day in Paradise". BBC Online. 29 January 2016. Retrieved 30 January 2016. ^ "Casa & Nova – official nomination for the Hollywood Music In Media Awards". casa-and-nova. Retrieved 19 May 2017. Awards for "Another Day in Paradise"